This project is a total scratch build, the parts for this model have been cut on a pantograph miller using my own patterns produced from dimensioned drg’s. These loco’s were built at GER works at Stratford (E.London) in 1893-1902, designed by James Holden they were used on the Liverpool St. – Bishops Stortford passenger trains and later on the Southend-on-Sea and Southminster branch services. After the end of the First World War they were relegated to cross-country routes and branch lines of the GER system. For this commission I have been asked to build this loco as LNER no. 7137 as she was in the mid 1940’s, she was withdrawn in ’47 and cut up in ’48. You will notice from the photo that she has an odd-looking chimney, this was a cut down “stovepipe” I believe fitted for emergency work on the Metropolitan and District line tunnels. So with parts cut I have started with the outer frames, buffer beams, or planks as they are sometimes called, and the foot plating. This is assembled upside down on a perfectly flat surface making sure that everything is square and vertical. Next is the assembly of the bunker/cab/tanks, the side sheets of which are all in one on the model. I started with the rear spectacle plate, bunker floor and cab rear lower plate being soldered to one side sheet. The cab front spectacle plate was soldered to the opposite sheet and then the two brought together and soldered making sure everything is square and upright. After cleaning up the tank inner sides, tops and fronts are soldered and cleaned up. 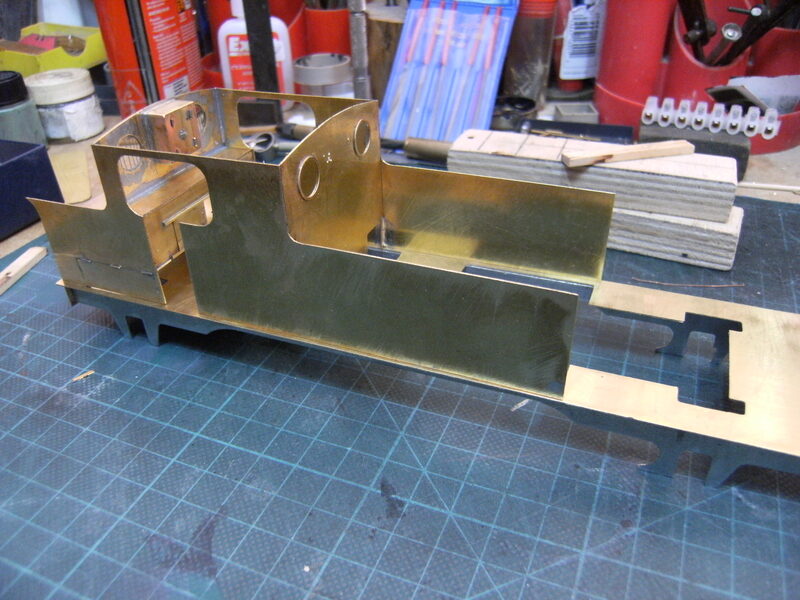 This whole assembly is then soldered to the footplate/ assembly. I should have mentioned that before all of this was done, the outer spectacle plate window rims (etched brass) were fitted and also the grills over the rear windows that face the bunker. In the prototype these were 3/8 dia. round steel bars, for this I have used .2mm nickel silver wire. 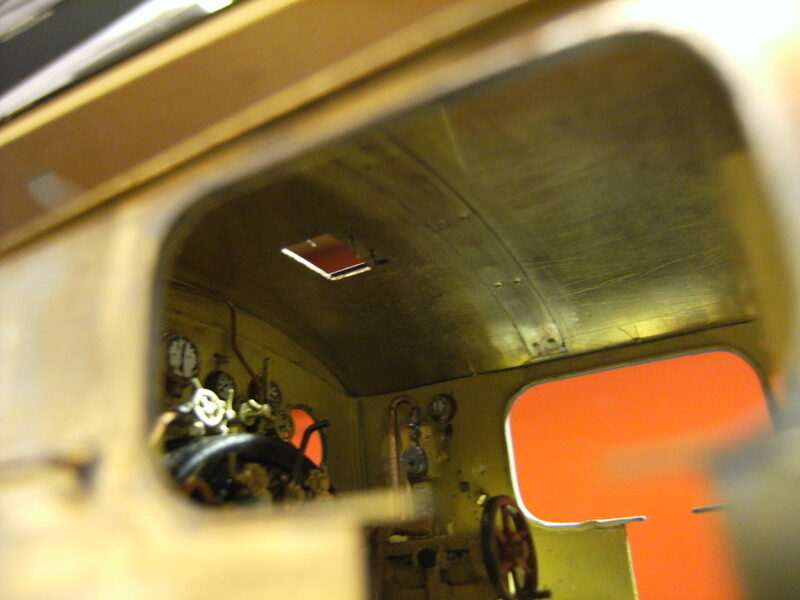 The cab interior was next, the bunker door on these loco’s was a sliding shutter, and on the rear cab sheet was a small tool cabinet, these I have replicated with thin brass sheet. 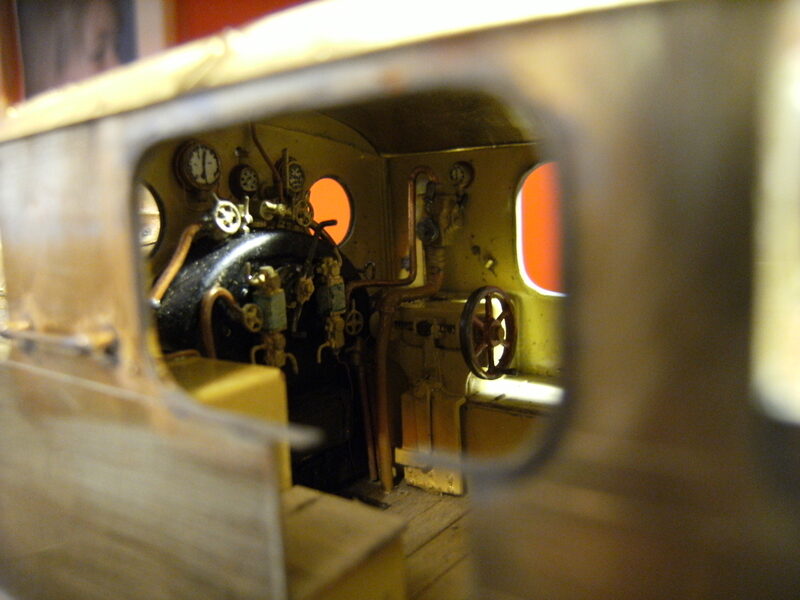 The upper part of the main frames has rivets added were the cylinders are mounted between the frames on the prototype, and then they are soldered to the footplate assembly. On our models, where we have to separate the body superstructure from the chassis, the frames have to be split horizontally on a line where the foot plate meets the frames. This maintains strength in the bodywork but also eases separation of the two halves. We now come to the smoke box and boiler components. 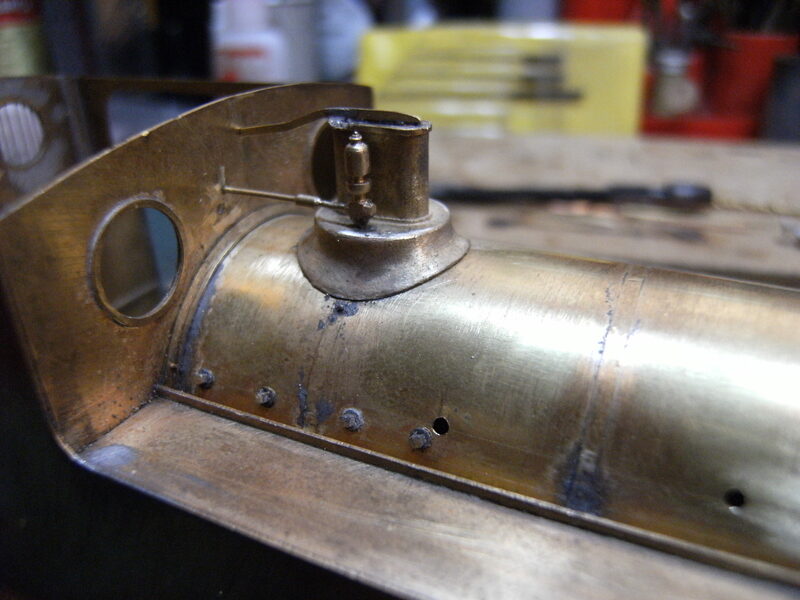 The smoke box front plate has a door sealing ring fitted around the opening. On the prototype this had a radial groove in its face, the same dia as the rim of the door, with asbestos tape placed in it to act as a seal. The boiler wrapper was formed in the rolling bars and soldered to the rear smoke box plate and then in turn to the front plate. Then a second wrapper is cut, this being slightly narrower than the first, the edges having rivet heads formed on a G.W. rivet press tool. 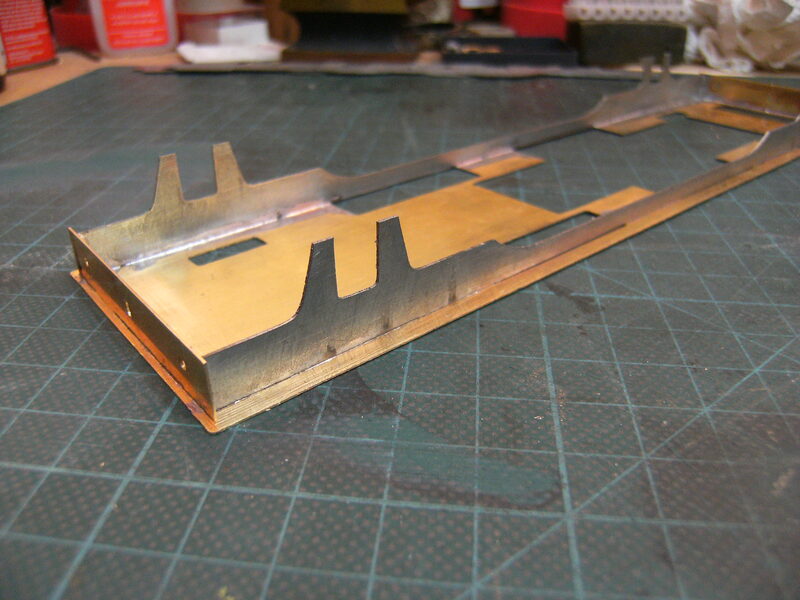 This was then soldered around the smoke box unit. 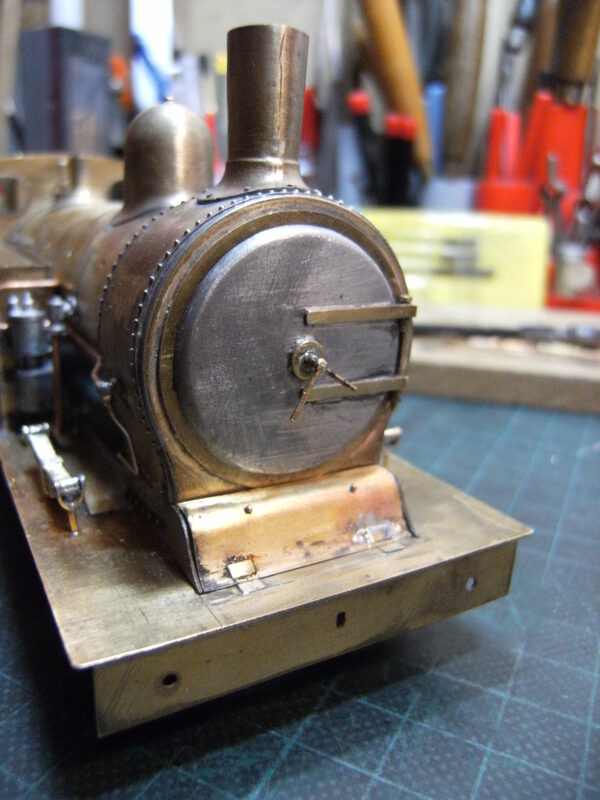 The sealing ring is now soldered to the front of the smoke box, I used solder paint and the RSU for this. 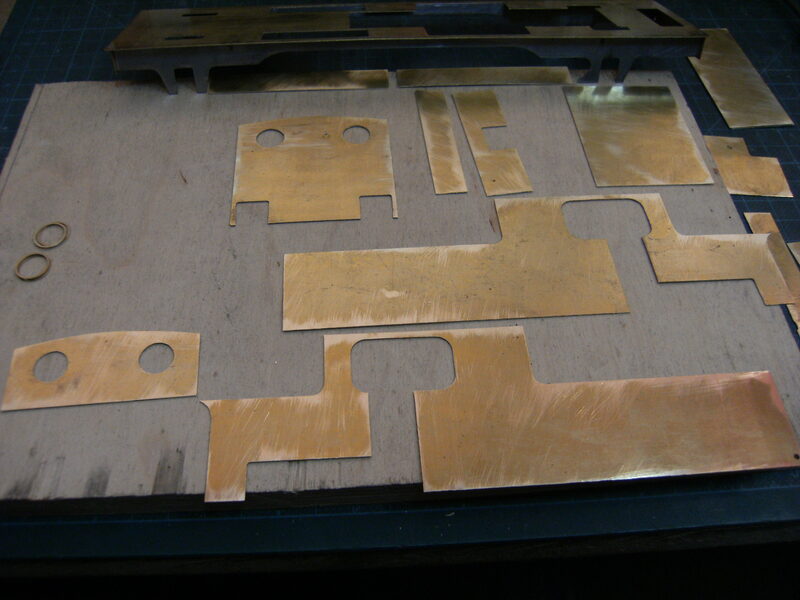 0.25mm sheet brass was cut for the boiler, the boiler band positions and a centre line were very lightly marked on the sheet to aid with positioning. I had machined a couple of boiler formers on the miller and these are now used to solder to the rolled boiler sheet. The front former was drilled to represent the tube plate. Previous to all this work the rear former had a hole drilled dead centre to accept an 8 B.A. 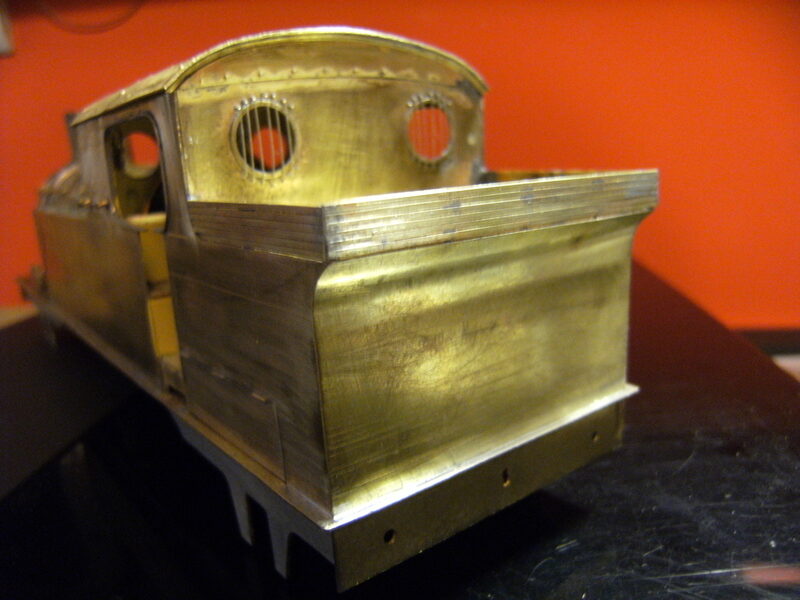 bolt, with a corresponding hole in the cab front sheet, this would enable perfect alignment of the boiler. 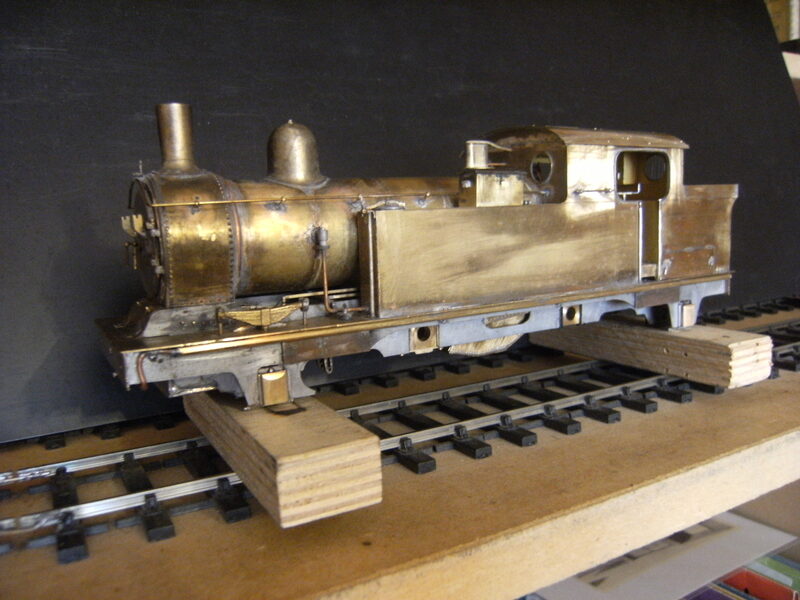 So the completed boiler and smoke box unit were assembled on the body/footplate assembly making sure that every part was parallel, square and upright. With the boiler bolted to the cab front the assembly was tack soldered and alignment checked before finally completing soldering all joints, kettle on and sit back before cleaning up. I had sourced castings for the dome and chimney from different suppliers, the dome in brass was perfect so this was cleaned up and soldered in place. The chimney is in white metal and needs care with fitting. Once cleaned up and drilled out, by hand, the first thing to check was the fit to the dia. of the smoke box, it wasn’t quite right. So I placed a strip of fine wet & dry paper on top of the smokebox and then held the casting on this while rubbing it backwards and forwards until the base of the chimney matched the smokebox. You have to be careful when doing this as there is a danger of taking off too much metal around the base of the casting and thus reducing the dia. of the base of the chimney. fortunately in this case only very little was needed to be taken off. This was then soldered in place. Now some fellow modellers have mentioned that they find soldering white metal a problem as it has a very low melting point, but with the right tools it couldn’t be easier. I’ll explain the method I use for those of you that find it difficult, for those of you who don’t you can go a put the kettle on !. For white metal I use an Antex 50 watt temperature controlled iron set on its lowest setting. There is no danger of melting the casting with the iron on this setting but it is hot enough to melt the 70 degree solder that I use for white metal. Now, this low degree solder does not adhere to brass or nickel very well so the method is to lightly mark the area that the white metal casting is to be fixed to, this area has to be tinned with the normal solder you use to assemble brass or nickel ( I use 60/40 tin/lead and my 100 watt Weller iron) Once you have done this, in the case of our chimney, you will have a circle of tinned brass where our chimney is to sit, make sure this surface is flat, ie. no blobs of excess solder, if so just gently flatten it down with some wet & dry but without removing the solder. To fix our white metal chimney we now position it making sure it is sitting nice and tightly to the surface and it is dead upright, holding it down with your finger on the top put some flux around the base with a small brush, at the top of the boiler will do, and then with the Antex on its lowest setting touch the low melt solder, to take some up on the bit and then just touch the joint between casting and boiler, where you applied the flux, and the solder will flow into the joint. Do not worry about going right around the joint, just enough to hold it in place, you can now let go of it, once the solder has solidified (which is almost instantly as you take the iron away), and check that the chimney is aligned correctly from all angles. If it is not correct just touch the joint with the iron and lift the casting off, clean up and start again. If all is well then start to solder the rest of the joint from the opposite side to where you started, this way there is no danger of it moving, just run the iron along the joint, use plenty of flux in the joint and don’t use too much solder on the iron, a little will go a long way. Once you have gone right round the joint you may have some gaps, it’s easy just to put a little flux on and a touch of solder to fill it, but don’t over do it. Any excess solder can be scraped or sanded away afterwards. With practice you will be able to solder joints with very minor cleaning up. Having told you how I fit a white metal casting to brass, using this build as an example, I decided I was not happy with the casting I had fitted. Looking at it on the model and comparing it with photo’s of the prototype it just didn’t look right, a bit of flux and apply some heat on the brass around the casting and off it came. 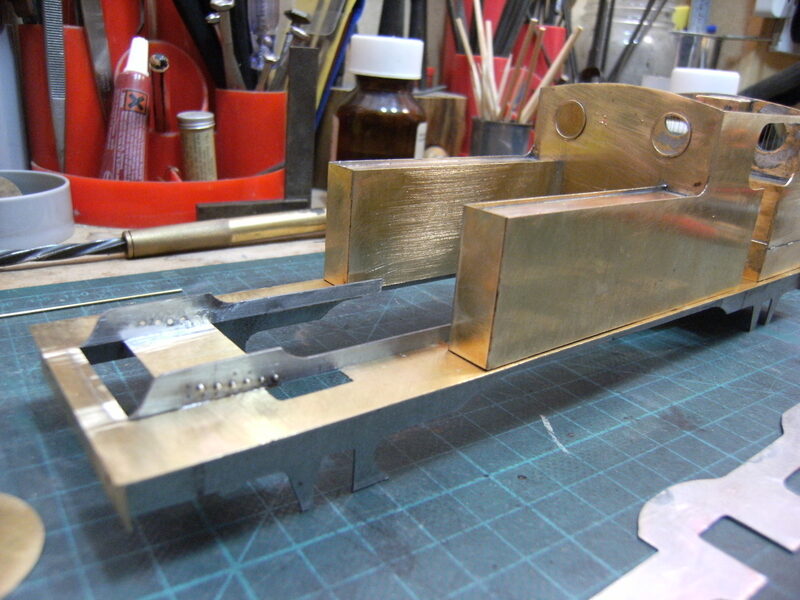 I have now obtained a correct casting in brass, this was a G.E.R. pattern “stovepipe” chimney, which I cut down, exactly as they did on the prototype (see photo at head of this page) at the beginning of WW2. The reason for this was for wartime emergency use on the Metropolitan and District lines. The camera lens makes the chimney look out of upright but I can assure you it is perfectly in line and upright on the model,…….honest! 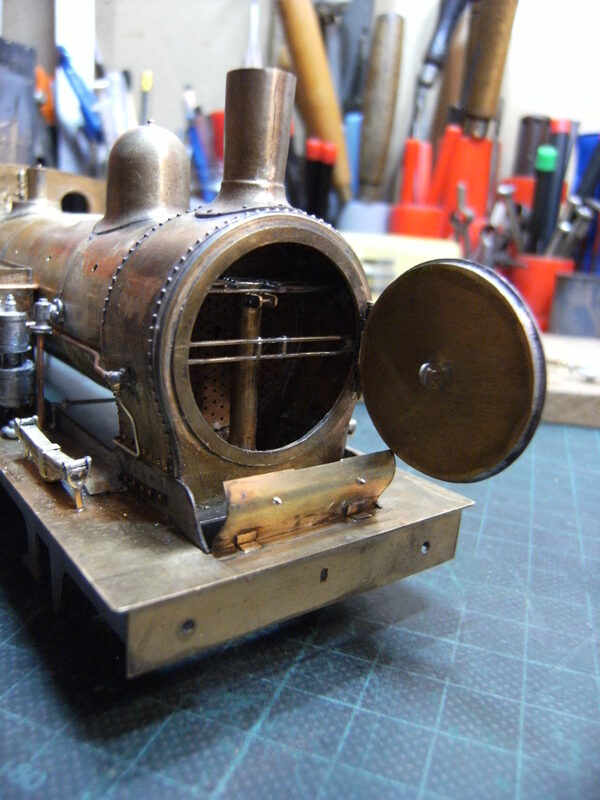 So on with the build and next to be fitted was the smoke box interior which consists of a blast pipe, spark arrester, steam pipe and the top of the cylinder block. 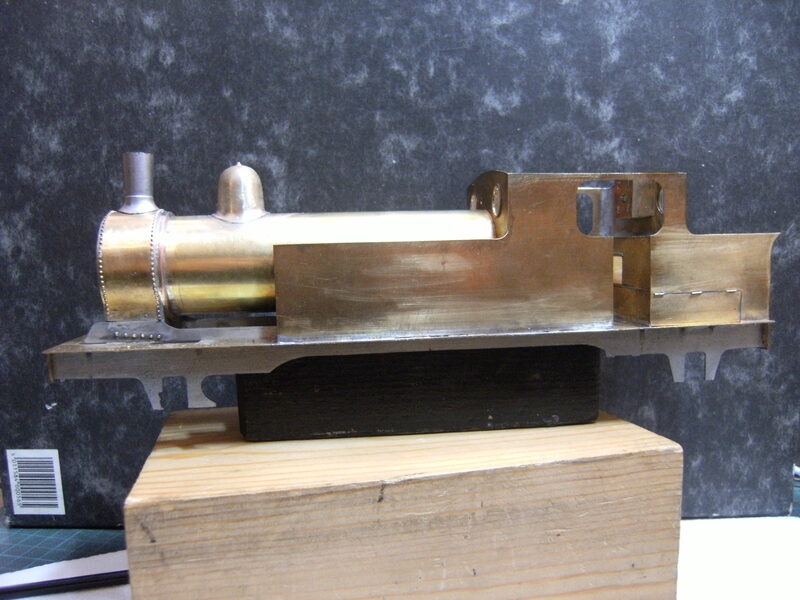 The smoke box door is a white metal casting and of accurate dimensions, but the hinges were not and seeing that I wanted to build it as a working detail these were filed off and correct pattern ones fabricated from brass and soldered on with the knuckles cut from brass tube and a nickel silver hinge pin. the dart was made using a 16 B.A. machine screw, the handles are proprietary castings, the inner one is tapped so it can lock while the outer handle is soldered on. 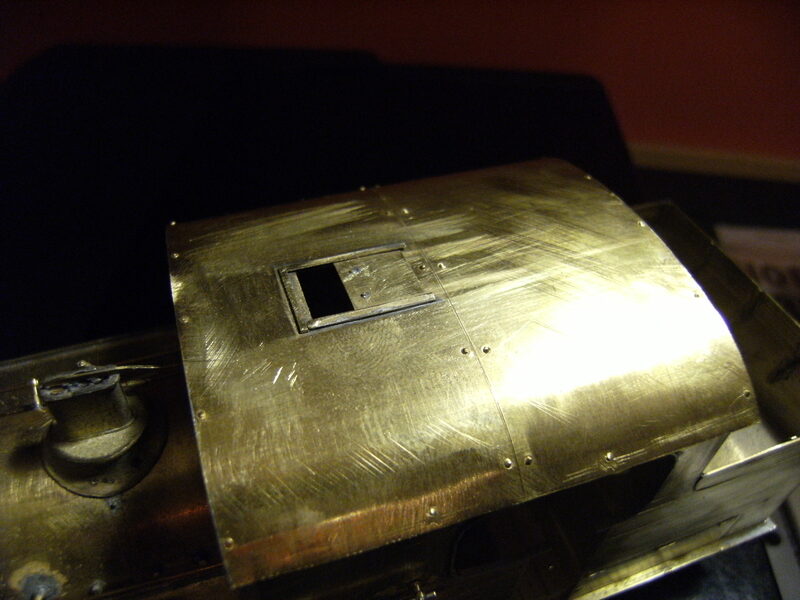 The heat shield on the inside of the door was cut from brass sheet and soldered to the door. 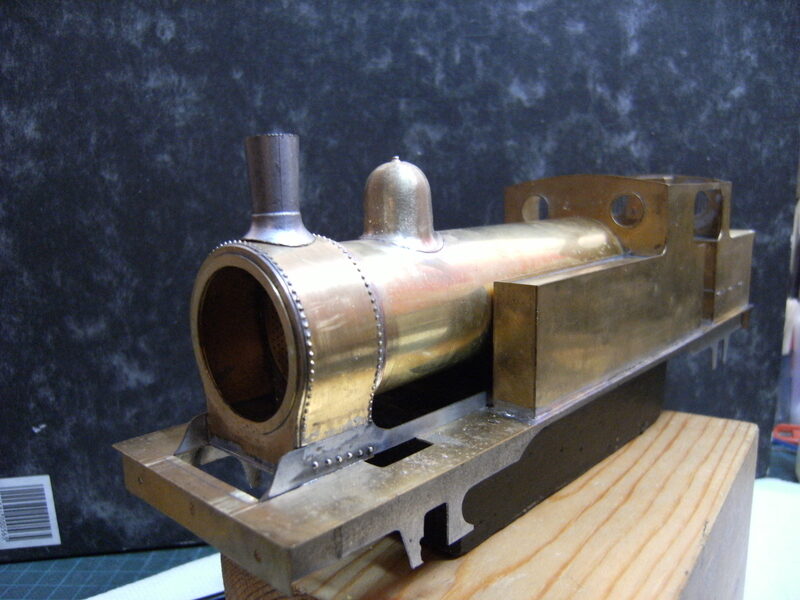 The hinged cylinder cover, below the smoke box door, was cut and shaped from brass sheet. 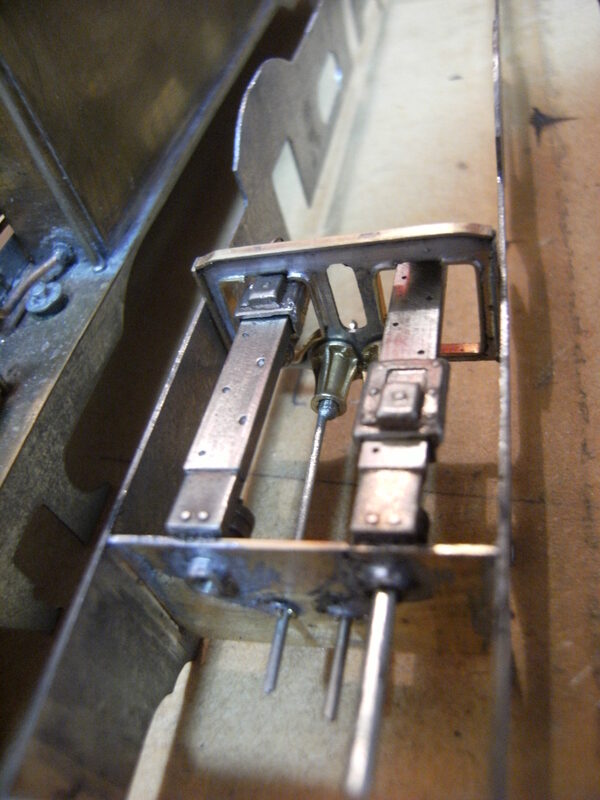 This is hinged with micro bore brass tube and nickel wire the knobs are turned brass rod while the hinge plates on the outside (which are only dummy’s) are brass shim. Next to be fitted was the safety valve casing and whistle. The safety valves on this loco were the early type fitted by the G.E.R. when new and retained by the L.N.E.R. through to withdrawal of the loco in 1947. G.E.R. pattern safety valves and whistle. You will notice in the picture on the right that I have also fitted a sealing ring, as I call it, between the cab spectacle sheet (cab front) and the boiler casing. This was produced from appropriate size brass angle, annealed, and curved gently around a piece of copper pipe that was just slightly smaller than the boiler. This was then soldered in place with the R.S.U and solder paint as was the safety valve cover, whistle. The wash out plugs were of the early type for this loco and as I could not source these I made them from brass tube and square bar, which represents these items quite well in 7mm scale I believe, and again fitted with the R.S.U and solder paint. Moving on now and the cab interior has had the floor fitted, this was cut from 4mm scale ply pointwork timbers being just about right, once it’s stained and covered in coal dust the grain of the veneer looks most realistic. The boiler backhead and fittings are mostly brass castings with pipe work of copper rod and wire. The gauge faces are inkjet print copies reduced down to 7mm scale and then cut out and glued in to the gauges. I painted the cab interior and backhead before I fixed the fittings, makes life easier and if you do damage the paint work it’s easy to touch -up afterwards. The roof was cut as one piece although the real thing was made from two sheets of steel. I scribed the joint on the outside, cut a hole for the sliding ventilator and marked out the rivet positions on the under side. This was then formed to shape with use of rollers and a piece of steel rod was used on the outer edges as the radius tightens up and is to tight for the rollers. 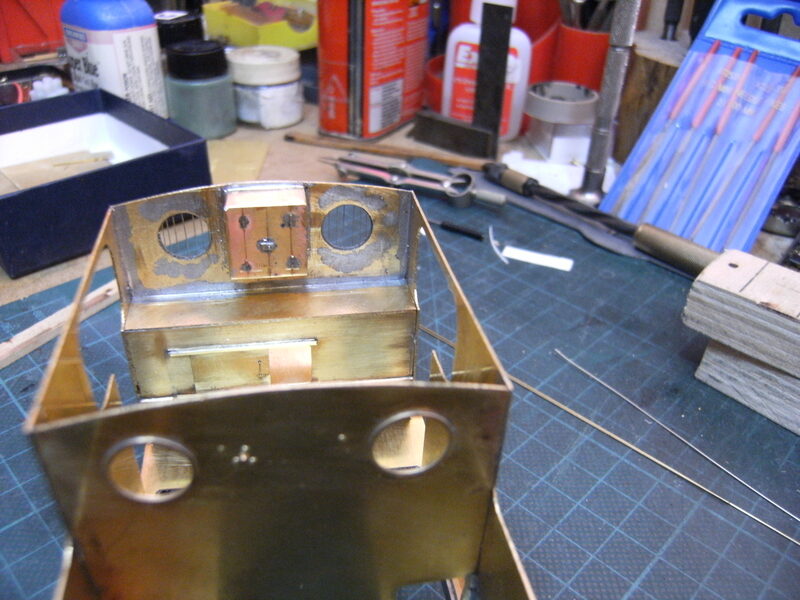 Next the rivets were pressed out and the joint was fitted with a cleat on the inside plus rivet detail. For the ventilator shutter I have used some .005″ brass shim and 0.35mm wire for a handle. This slides in some etched rebated brass strip which forms a frame on top of the roof, I think the photo’s explain it easier than I can describe it. The underside of the outer ends of the roof have an angle fitted to them, as the prototype, and this holds the roof to the cab. 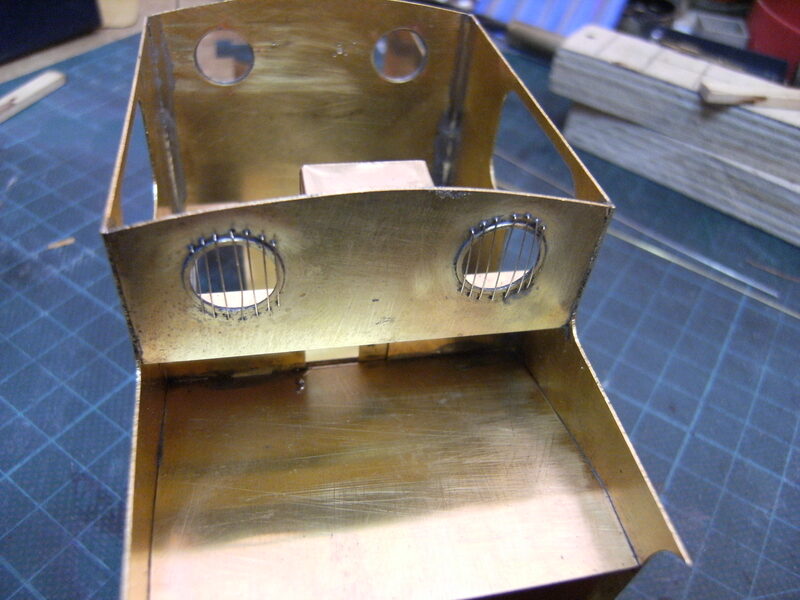 Onto the bunker and the extension rails around the top edge are made from 1/64″x 1/32″ brass flat bar, 1mm x 1mm brass angle brackets in the corners with more of the brass bar supporting the middle of the coalrails. This was all assembled using the RSU and 188 solder paint. The leading and trailing axles not only had horn blocks and bearings on the main frames they were also supported by bearings on the outside frames. There are no castings available commercially so I have scratch made these from brass bar and then soldered them in place on the outer frames. Wheels are Alan Harris castings and I have made a start with turning these up on the lathe and mounting on telescopic split axles as supplied by the S7 Group stores. We now turn to the chassis, the frames of which have been cut from mild steel, spacers and the motion plate are cut to a dimension to give 29.00mm o/a the frames (dead scale) as this is model is being built to Scale 7 standards. 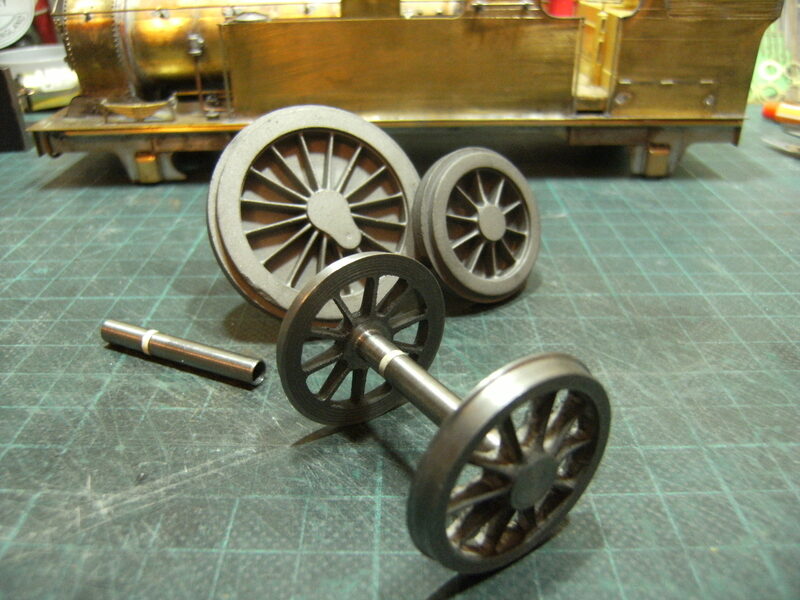 The hornblocks are of the insulated type all barring the crank axle, the insulation being between the boss of the wheel and the axle.The wheels on this axle will still collect current but is transferred through the coupling rods to the second drive axle where current is picked up by the motor which also picks up from the leading and trailing wheels. 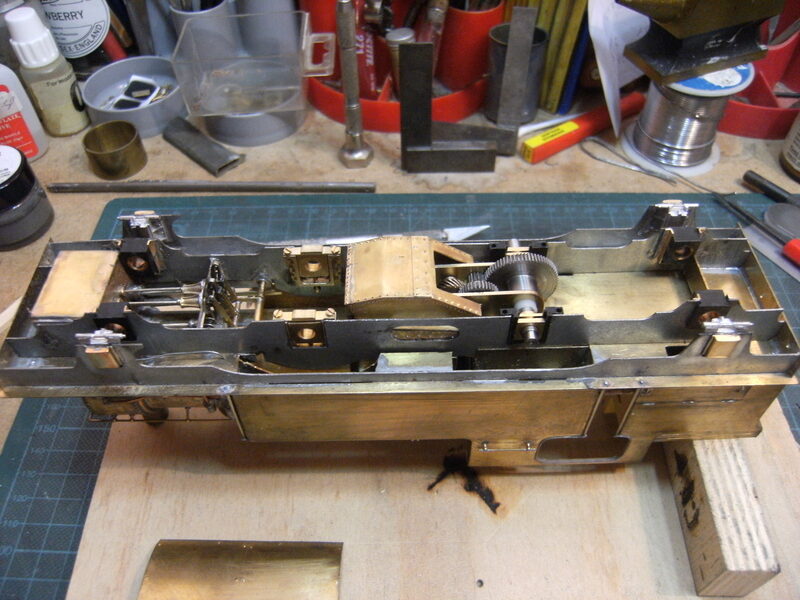 The ash pan and cylinder block were cut from sheet brass and fitted, note the ash pan has to be cut to clear the gear box frames. By this stage the lifting links, expansion links and weigh shaft have all been fitted. Once the wheels and axles are fitted the brake gear can be assembled and once again these are from Laurie Griffin’s range of castings. With final running in completed the model can be painted, lettered and weathered. Please go to the gallery’s both here and on my website www.eastsidepilot.com to see more pictures of the completed locomotive. Any comments you have are gratefully received. Looking really nice mate.. especially like the curved angle sealing ring, simple but makes all the difference..!! I used the milled brass angle that Peter has in stock, but you’ll have to aneal it to curve around that size radius mate. Wow! 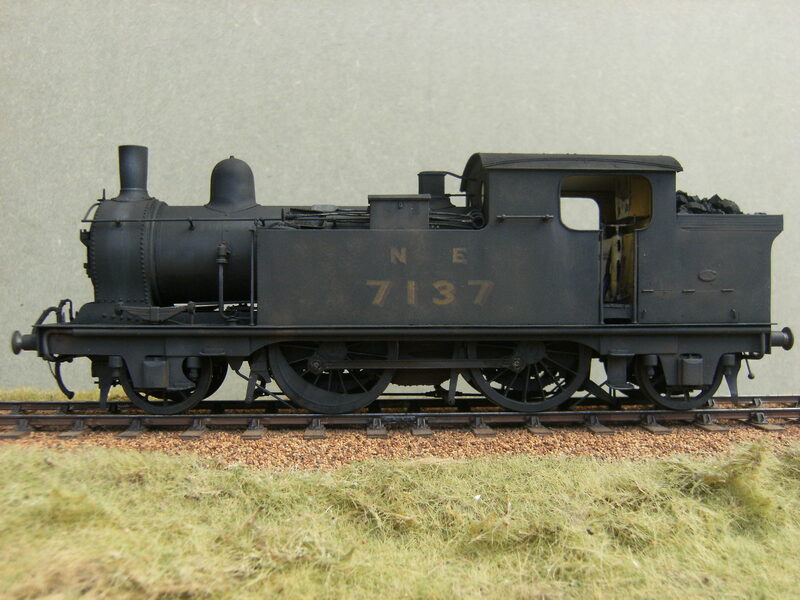 How refreshing to see modelmaking of this quality, Great Eastern too. Very nice F3. Thanks Ian, it’s a protoype not often modelled and I’m looking forward to building another example for my own collection.